If you’re the sort of person who is concerned that you might hurt someone’s feelings just by saying the wrong thing, becoming a vampire is probably going to be a tricky thing to get your head around, as surgeon-turned-vampire Dr. Jonathan E. Reid is about to find out. Being a good doctor, he’s taken an oath to heal rather than hurt, so the need to drink blood straight from the victim’s throat is probably not something that’s going to come easy. Developer Dontnod uses this to the game’s advantage and gives the player a choice over whether you want our Jonathan to go full vampire or refrain from the old neck biting and find other ways to get his fill of the red stuff. That’s not until after he’s taken a bite out of his own sister’s neck, though and found himself on the run from the authorities in post-WWI London. With the Spanish Flu having taken many lives at home and people still reeling from the great war, it’s no wonder that everyone is a little on-edge already, but having vampires roaming around is one step too far for them. The world is populated with people to talk to in your quest to find out who turned you and work out what you need to do to set things straight (or,indeed, what path to take if you don’t). Characters have branching conversations, some of which are locked and require some research or spying, or the more traditional style quests, to unlock in order to find out more about that person. As well as the many characters you’ll meet and talk to, the game throws militia at you and others who want to stop you in your tracks. This forces you in to fights even if you’re trying to be passive the rest of the time. Unfortunately, combat itself feels quite basic, this is no Arkham Asylum style brawl. You do get by though and learning new abilities as well as building your power up helps. There’s a mechanic in Vampyr that few other games have been able to pull off; how choice reflects the world around you. This is far removed from the sort of Telltale ‘he will remember that’ moments and actually has a huge impact on the game. As you progress and meet more characters you find out more about each one. Doing so adds to the power of their blood in a sort of traditional XP style but it also makes you realise what they mean to this universe. If you kill them, then, you’ll gain more abilities and power but also affect the way the game world works. It’s quite an impressive feat that mostly works and does make you think twice about just biting into another human snack. An even grander impact is that taking out too many of an area’s inhabitants leads to a breakdown in society, an area where side-quests disappear and you’ll find it tougher to walk through the streets uninterrupted. Conversely, not drinking fresh human blood will prevent you levelling up quickly and you’ll find it very hard to gain the skills you need to defeat the harder ‘boss’ style characters. Moral choice or well balanced game mechanic? Either way, it’s one of the best systems for making you think about your own actions I’ve ever seen in a game. Every character is voice acted, though some more convincingly than others, and all are rendered with care, as is the London environment with its smog and dimly lit side streets. This all adds to the excellent atmosphere of the post-WWI setting. There were a few bugs during my playthrough, but they were few and far between and none of them were anything major that stopped me enjoying the game. 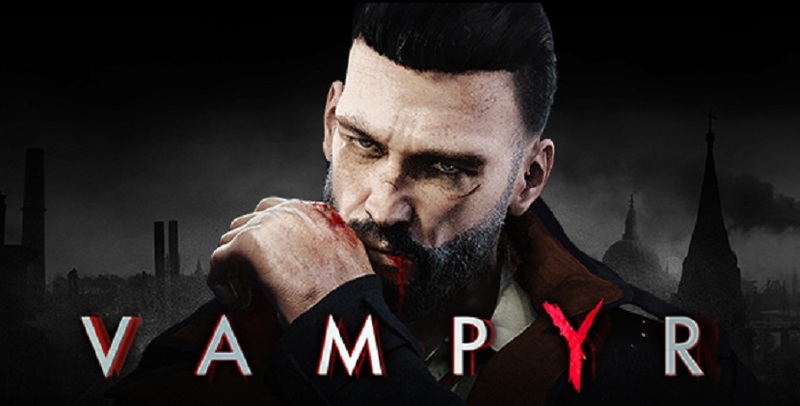 With a world that feels like it really is alive and each side quest feeling like a mini-story of its own, Vampyr would be an impressive game, but add in the whole moral dilemma and the way the game world reacts to your decisions and you have something fascinating. The odd bugs, mixed voice acting and occasional stutter isn’t really enough to keep Vampyr’s qualities from shining through.